Before we get to my favorite new recipe from Baking With Betty, I have to tell you about Lake Minnetonka! The evening boat ride was a definite highlight of the trip. Sailing around lake and seeing all the gorgeous mansions and beautiful landscapes, made me feel a little homesick for the Midwest. After being in Phoenix for many years, I had forgotten how lush and green summers are for everyone else. 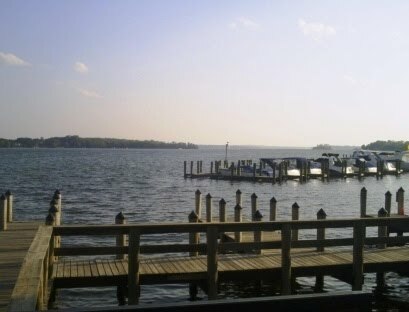 If you ever visit Minneapolis do not miss a chance at seeing Lake Minnetonka! 1. Blend cookie mix, 1/3 cup butter and egg until soft dough forms. Press dough in bottom of greased 9-inch square pan. Bake at 350°F 15 minutes. 2. Heat 1/3 cup butter, brown sugar and cranberries over medium heat, stirring constantly, until mixture comes to a boil. 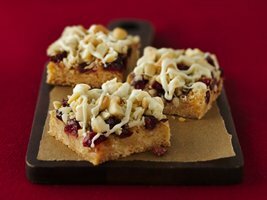 Spoon and spread cranberry mixture evenly over partially baked cookie base. Sprinkle with nuts. 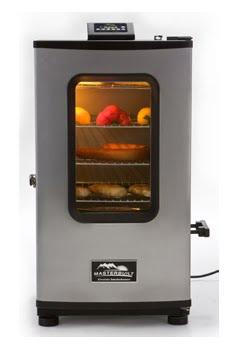 Bake 10 to 15 minutes or until light golden brown. Cool completely. 3. In resealable freezer plastic bag, mix baking chips and oil; seal bag. Microwave on High 30 to 45 seconds, squeezing mixture in bag every 15 seconds until smooth. Cut 1/4-inch top from corner of bag; drizzle over bars. 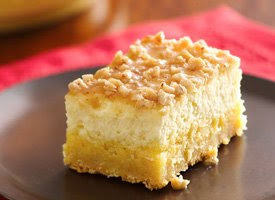 A close second is the Crème Brûlée Cheesecake Bars. Both use a Betty Crocker sugar cookie mix for the crust. 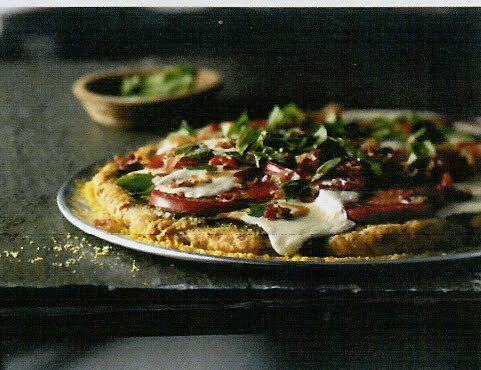 This, of course, was much easier and quicker than making a crust from scratch. I often over bake my crusts when I’m making bar cookies, but I am sold on using the cookie mix now. The crusts were firm, but still chewy and moist. I was really impressed. 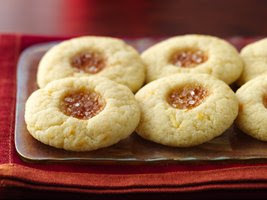 There are tons of recipes for all kinds of cookies on the Betty Crocker site. 2. In small bowl, beat cream cheese, sour cream and sugar with electric mixer on medium speed until smooth. Add remaining whole egg, 3 egg yolks and remaining 1 1/2 teapoons vanilla; beat until smooth. Spread over crust in pan. My favorites appear to be the favorites of others, too! They were disappearing fast! 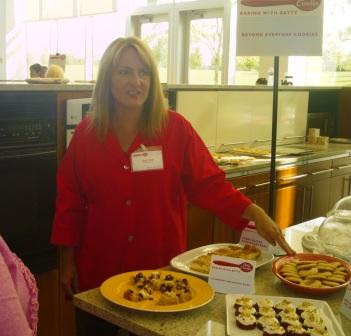 Sherri, from Betty Crocker, shared lots of fun tips and recipe ideas for cookies. Mandy is busy making some cute "school snacks" so stay tuned for more fun this week! Hello! 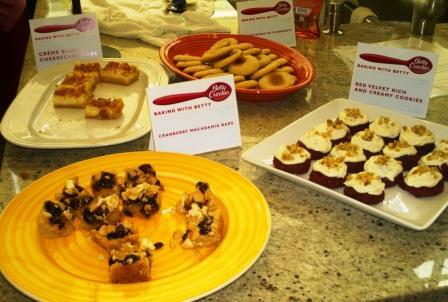 It’s Gourmet Sister here to tell all about the Baking with Betty Event at the General Mills Headquarters. Mandy was unable to go to Minneapolis, so I happily went in her stead. 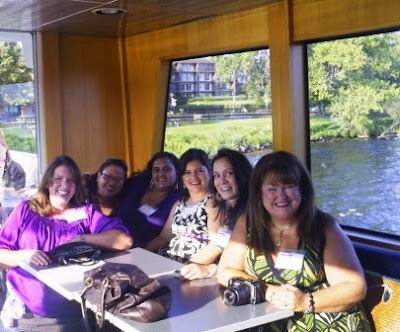 The whole trip from the Dinner Cruise to the Baking Party was amazing, and I had a wonderful time. Everyone there was gracious and happy to share tips, and of course, recipes! 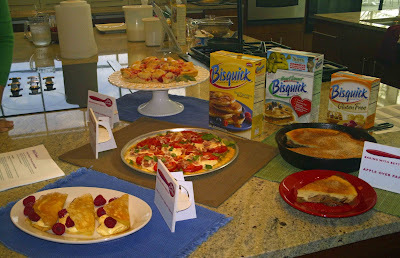 My first session was "It's All about Breakfast", featuring easy and quick recipes using Bisquick. I was feeling a little daunted since I never use Bisquick. My family is on a budget and we have allergies so we don’t usually buy many packaged foods. But, the Fresh Lemon Cream Crepes recipe has changed my mind about Bisquick. Tonight I tried it out on my “meat and potatoes” family. It was a huge success. My in-laws are coming over tomorrow, so I’m making ahead, a platter of crepes for dessert. I was impressed with how quick and delicious this dish was! There are tons of Bisquick recipes on the Betty Crocker website that have moved way past pancakes. 1. In small bowl, beat Bisquick mix, sugar, ½ cup milk, the melted butter and eggs with whisk or fork until blended. 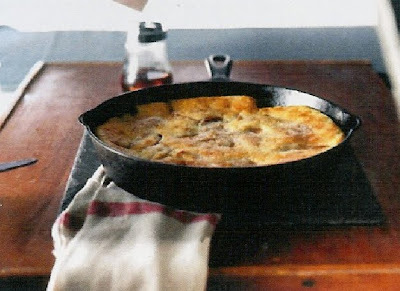 Grease 6- or 7-inch nonstick skillet with shortening; heat over medium heat until bubbly. For each crepe, pour 2 tablespoons batter into skillet; immediately rotate skillet until batter covers bottom. Cook until golden brown on bottom side. Run wide spatula around edge to loosen; turn and cook other side until golden brown. Stack crepes as you remove them from skillet, placing waxed paper between each; keep covered. 2. 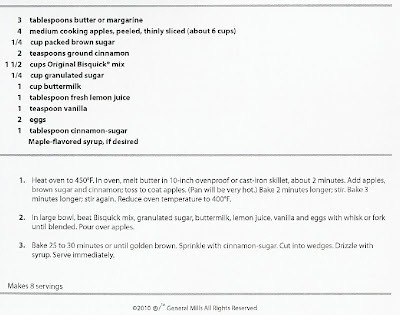 In small bowl, beat sour cream, ½ cup milk, the lemon peel, lemon juice and pudding mix with whisk or fork until blended. 3. To assemble each crepe, spoon about ¼ cup of the filling on one end of crepe; top with 5 raspberries. Roll up; sprinkle each crepe with powdered sugar. 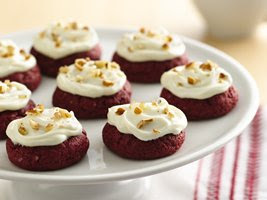 Serve with additional raspberries. We also got to make so many other delicious recipes using Bisquick, many aren't on the website yet, so you can be the first to try them out! There were so many other fun bloggers in attendance, if you haven't visited them, you may find a favorite read! 24/7 Moms, Hoosier Homemade, Jamie CooksitUp, Baking Bites, Taste and Tell, Joys Hope, Fake Ginger, Real Mom Kitchen, Kitchen Girl Jo, MomSpark, Megan's Munchies, A Few Shortcuts, The Snyder5, MyBlessed Life, Save at Home Mommy, Utah Deal Diva, Mora Piggy, MisaacMom, Musings by Jacquelyn, Frugal Living, Family Fresh Cooking, I Am Baker, Your Fun Family, Mami of Multiples, Latina on a Mission, Modern Mami, My Big Fat Cuban Family, Mama Latina Tips, Nika's Culinaria, 4Tunate. I was inspired by these adorable caramel apple boxes that I found on vacation! You can check your local cake/candy supply store, I also found some online here. In the baskets, we placed a Bath & Body Works Apple Hand Sanitizer, a little pack of these SUPER CUTE (& free!) printable cards from Posh Pixels Studio, and a Caramel Apple. All ready to be boxed up and sent off to school! The girls loved this easy project (and so did I!). I'd love to hear any back-to-school traditions you have! Are you ready/excited for school? At our house, we have a new Kindergartener! This easy sandwich would also be so cute sent to school for a birthday lunch! Make sandwiches. Find cups, lids, or cutters of 3 different circle sizes & cut out sandwiches. Microwave one yellow and 1/2 orange starburst candies for about 7 seconds to soften. Place orange candy on top of yellow, smash together and form a "candle flame" shape. Push onto the top of a pretzel rod. Stack sandwiches with the largest one on the bottom and press pretzel rod "candle" through the sandwiches (you can cut the pretzel if it's too long). Serve with shredded carrots or any other fresh fruits & veggies. CELEBRATE!! :) We don't like to be wasteful, so I served the extra sandwich "scraps" on a little plate on the side. Congratulations, Big Girl! We are proud of you! Hi Everyone! We're back from vacation and we have lots of fun coming your way this Fall! The start of the school year is a time for new things so why not incorporate that into your family's mealtime? How about a little Food Adventure? I have something fun for your family to try! I made up some Food Adventure Passports that you can download and print here. Simply print the cover, add some plain paper, fold in half and staple. As you try new foods, your kids can write about them, draw them, put in photos, write about the country it's from, whatever you want! It's also a great conversation-starter for dinnertime. 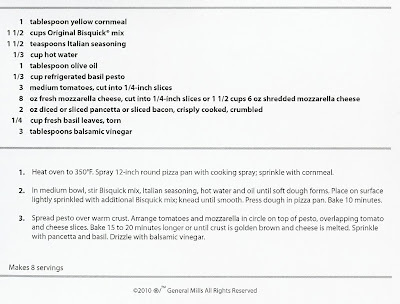 Looking for an idea for dinner tonight? Here's a video of me showing you how to make an Easy Cheesey Swiss Potato Pancake. 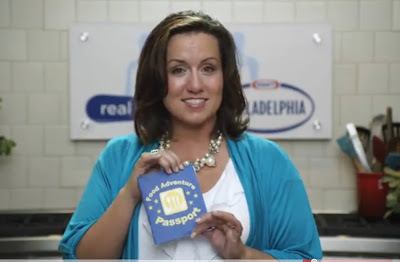 This week on Real Women of Philadelphia, I'm hosting an International Side Dish Challenge. 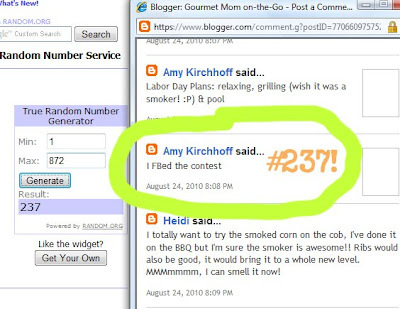 You can go here to join in on the fun and your recipe could win $500! It's that time again! For the next two months, we'll be featuring lots of fun things for school lunches as well as classroom snacks. I've got some fun ideas coming! While I'm on vacation, I have a little something fun for you to help get ready for school! As your family starts to think about the new school year, you may be wondering how you can collect the most Box Tops to help support participating schools in your area. We love Box Tops! When Big C was in Kindergarten, they'd have fun class contests to collect them and the whole school got involved. It's such a great and easy way to earn money for your school! I keep a quart ziploc bag in my silverware drawer so I can throw in Box Tops as I come across them. Guess what?! At the Sam's Club Back-to-School event from Aug. 11-Aug. 31, you can get a head start on your collection and find 6 Box Tops on participating General Mills products!! 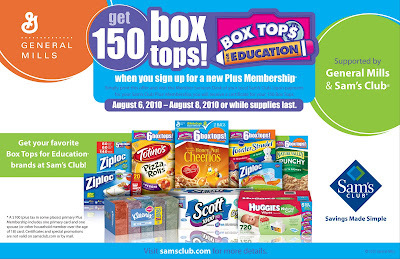 In addition, Sam´s Club is giving you the opportunity to earn even more Box Tops when you upgrade to a "Plus Membership." 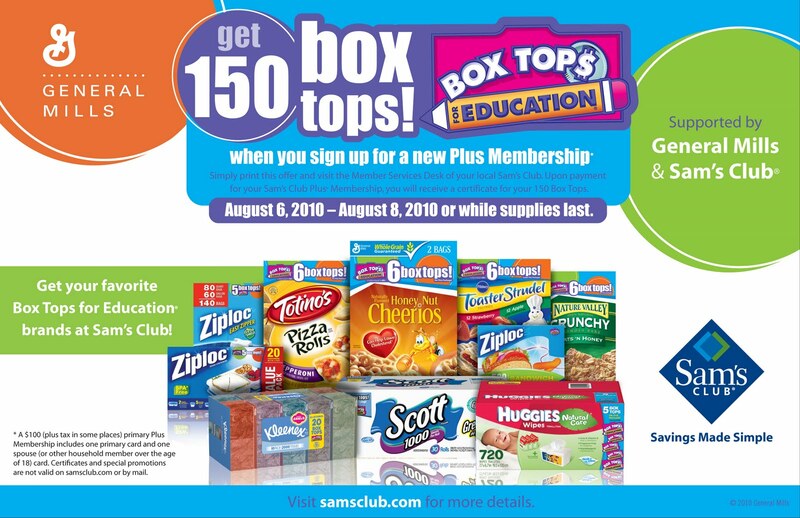 From Aug. 6 - Aug. 13, or while supplies last, visit the Member Services Desk of your local Sam´s Club and upon payment for your Plus Membership, you will receive a certificate for 150 Bonus Box Tops! For more information on how you can take advantage of the Back-to-School event at Sam´s Club, visit http://www.samsclub.com/ today! To celebrate, Sam's Club is giving one Gourmet Mom-on-the-Go reader a $25 Sams Club Gift Card so you can go buy some of your favorite Box Tops products! "Our family loves the fiber one bars. Also honeynut cheerios!!! " Please contact me within 3 days to claim your prize! Congrats! Disclosure: I was given the information, gift card, and Sams Plus Membership from Sam's Club and General Mills through MyBlogSpark. All opinions, as always are my own. I was not compensated monetarily for this post. Don't worry, we'll be back next week with fun culinary adventures! In the meantime, have you seen my Real Women of Philadelphia cooking video debut? I loved every second of making these videos and was so honored to have spent some time with Paula Deen. I hosted the Time Crunch Side Dish Challenge and it was so fun! I'll be hosting three other side dish challenges and I would LOVE IT if you'd come over and submit your recipes! They're choosing a winner each day for 16 weeks! 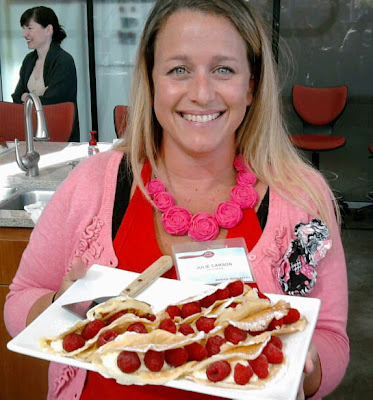 You will get $500 and a spot in the new Real Women of Philadelphia cookbook! Pretty awesome! Also, this time guys can enter, too! So, come on over and join the fun! This week it's an Entree challenge and next week it's Desserts, so there is a lot of fun to be had on the RWOP site! Make sure you find me (username: Mandy H) and add me as a friend so we can chat about our kitchen adventures & recipes!